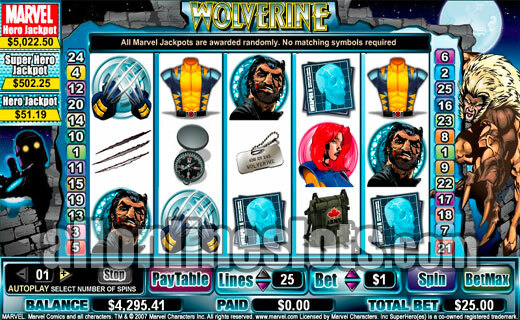 Wolverine is a Marvel Jackpot slot by Cryptologic. It has a great animated bonus feature where Wolverine and Sabretooth fight it out to win prizes. Top line win is 3,000 coins and every spin has a chance of winning one of the Marvel Jackpots. Wolverine made his first comic book appearance in the Incredible Hulk comic books in 1974. More recently he has reemerged as one of the stars of the X-Men series of motion pictures. 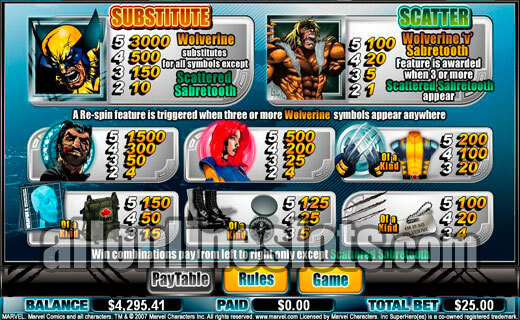 The Wolverine slot game from Cryptologic marks his first appearance on a slot machine. The game is part of the Marvel Jackpot series found at all Wagerlogic casinos. All games in the series feature a random three tier jackpot link. These jackpots hit at random and do not require you to line up any specific symbols. Wolverine uses the popular 5 reel, 25 line format and has two bonus features. 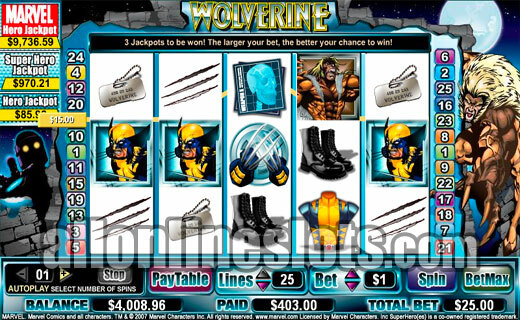 The top jackpot on the reels is 3000 coins which is won by hitting five of the wild Wolverine symbols on any active pay line. The wild symbol substitutes for all other symbols except the scattered Sabretooth symbols. The Wolverine symbol also initiates the first bonus feature. Get three or more wilds anywhere on the reels and you win a re-spin bonus. The wild symbols are held and the rest of the reels re-spin once. This makes for some interesting game play as if you miss the jackpot by one or two symbols you get another chance at hitting the top jackpot. Second highest pay is for the five scattered Sabretooth symbols which pay 100 times your bet or 2500 coins if you are playing all lines. Third highest win is 1500 coins for five James Howlett (Wolverines alter ego) symbols. From here five symbol pays range from 500 to 100 coins. 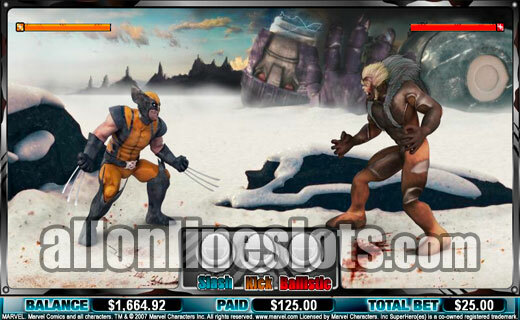 The scattered Sabretooth symbols activate the Wolverine Vs Sabretooth bonus stage. Get three or more and you move on to the second screen where you get to see a great animation of a fight between the two rivals. (Screenshot). Here you have three attack style choices - Slash, Kick and Ballistic. Selecting one of the attack styles make Wolverine attack Sabretooth. If your attack is successful you are awarded a random win amount. You get to continue until either Wolverine or Sabretooth is beaten. If you manage to defeat Sabretooth you get an additional bonus added to your feature payout. Wolverine is an entertaining video slot to play. The re-spin feature gives you a slightly better chance of hitting the top jackpot and the bonus screen stage features impressive graphics and the chance at some nice wins.